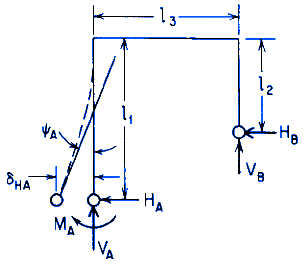 Reaction and deflection formulas for in-plane loading of elastic frame. 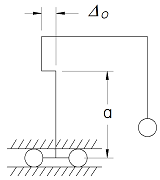 Concentrated Lateral Displacement on Left Vertical Member Elastic Frame Deflection Left Vertical Member Guided Horizontally, Right End Pinned Equation and Calculator. Loading Terms LPH and LPM are given below. Reaction loads and moments VA and VB, and HB can be evaluated from equilibrium equations after calculating HA and MA.